Start your summer racing right with this beautiful seaside Swimrun in East Sydney. Forget the bike, this multistage swimrun features beautiful views of Parsley Bay and some serious sea swims. Great for beginners, come for the views, the breakfast and the kudos. The 3 Bay Challenge is a three-stage biathlon where participants run between and swim at three of Sydney's iconic harbour beaches: Nielsen Park, Parsley Bay, Watsons Bay. The course consists of three running legs and three swimming legs. Total distance is 6km run and 750m swim. The race starts at 7:30 am, at Watsons Bay and participants will follow the red route marked “Run OUT” towards Nielsen Park, via the Parsley Bay Bridge (3km). After the swim at Nielsen Park (250m), participants will run back along the “Run IN” route towards Parsley Bay (2km) for the second swim (350m). 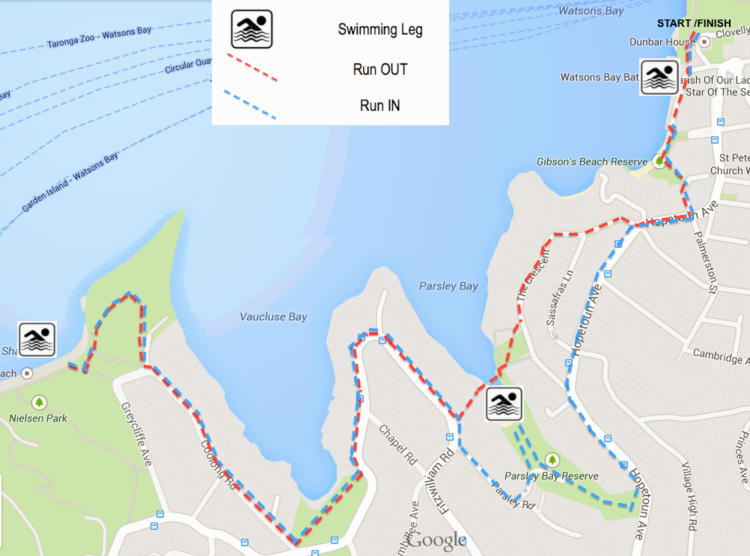 After the swim, the run route goes through Parsley Bay Reserve and towards Watsons Bay (1km), via Gibson’s Beach Reserve, for the final swim (100m). What to wear to the event? But the majority of participants run in shoes and their swimmers only. Before each swim, you take your shoes off (as the swims are a circular route) and you put them on again when you take off on the next leg of the run. Yes, there will be an area for bag drop at the start of the race. Someone will be watching this area for the entire race. We do encourage you not to leave valuables in your bag, as we do not accept liability for loss, theft or damage to your items. Wonderful race. Lovely conditions. A better more obvious finishing area would be great. A good kick off for training for the swim|run event in April 2019. Had a fantastic race. The bush bashing part on the run from Parsley was a little red hot due to moss. But was great!!!!! Great local race, friendly people and well organised. Could have done with a few more marshals on key corners but other than that all was great. It was great that the proceeds went to a good cause too and also good knowing that the event organiser are not being greedy and taking the profit as is the case form many events these days.It would be great if this was a series of races and even better if there was chip timing! I didn't think the maps really showed the race.